In this tutorial you will learn how build and deploy your first .NET application as microservice or SOA service on JLupin Next Server platform. JJE is the extension module for JLNS platform version 1.2 or higher. JJE extends the capabilities of JLNS platform with the ability to host and execute .NET modules as JLNS applications. Before reading further, make sure that you have installed Javonet JLupin Extension on your JLupin Next Server instance following this guide: How to install Javonet JLupin extension on JLupin Next Server. 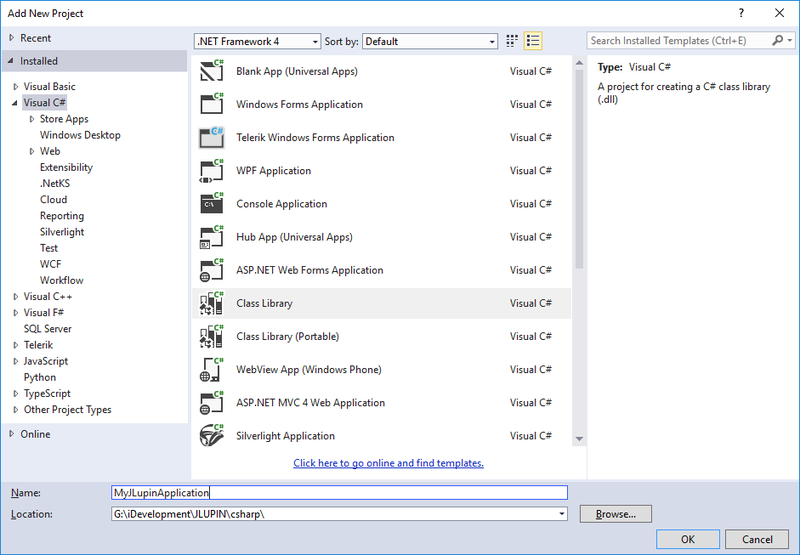 To create the .NET application for JLNS platform all you have to do is create simple .NET Class Library project and provide the Microsoft Unity IoC framework configuration file which will specify which objects should be exposed for clients through JLNS platform. Please notice that you can use any existing .NET module that expose at least one public class. This guide will show you how to build sample project that can be hosted on JLNS platform using Visual Studio 2013. This is the standard Microsoft Unity IoC configuration file. The file can be either provided as separate file or compiled as embedded resources. Remember that while using the compiled embedded resource you should properly declare the file name with library namespace in JLNS application configuration file as described in 2.5.2 step 4. Please notice two important sections. First the typeAlias where the name of your sample “Class1” type is configured. Make sure that you are always using types identified by full qualified assembly name like: MyJLupinApplication.Class1, MyJLupinApplication, Version=1.0.0.0, Culture=neutral, PublicKeyToken=null. Next please have a look at “type” registration. Currently JJE supports only the types registered with name as the name is used to identify the service in JLNS requests. Give the name for your object that you want to be exposed on JLNS platform and mark it as singleton. Marking as singleton is optional however due to the architecture of JLNS it is recommended to use singleton for objects that will be exposed on the platform. In this way you can be sure that your object will be initialized while starting the application and will properly serve all the clients and will support the hot-redeploy failure prevention mechanism. Compile your project and you are ready to deploy on JLNS platform. Once you have prepared your first .NET project for deployment on JLNS or you have taken your existing .NET library and defined which objects should be exposed using the unity-services.config file, you can deploy your application on JLNS. Copy the content of your compiled .NET application with unity-service.config file to the “MyJlupinApplication” folder on JLNS. 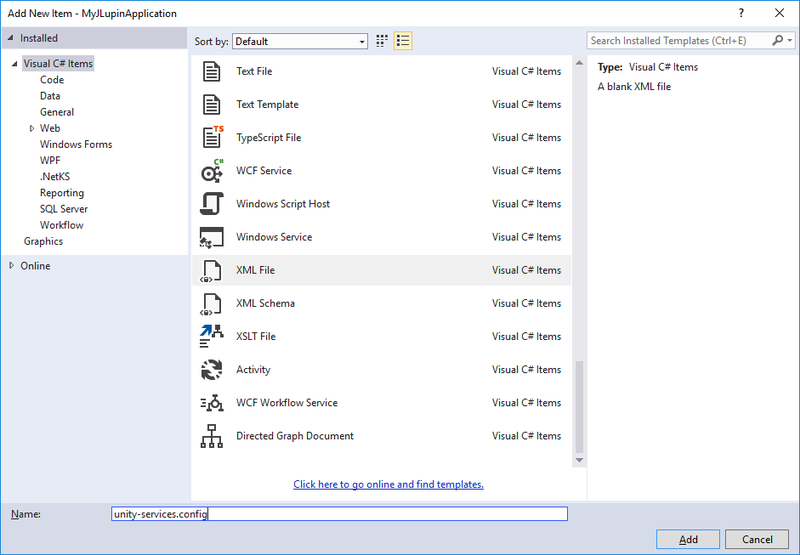 Copy the sample .NET application configuration file from JJE-Package folder JLupinSampleDotNetApplicationConfigurationImpl.javaThe only difference between standard and .NET application configuration file is the definition of JLupinApplicationContainer. As you can see on the snippet above instead of standard ApplicationContainer the JavonetSingleApplicationContainerForLocalProcessImpl container is initialized. “embeddedresource:unity-services.config” – this points to the unity-service.config file stored in our application folder or file compiled to your library as embedded resource. While providing file as embedded resource remember to include the library namespace in the file name declaration in example: embeddedresource:MyJLupinApplication.unity-services.config. 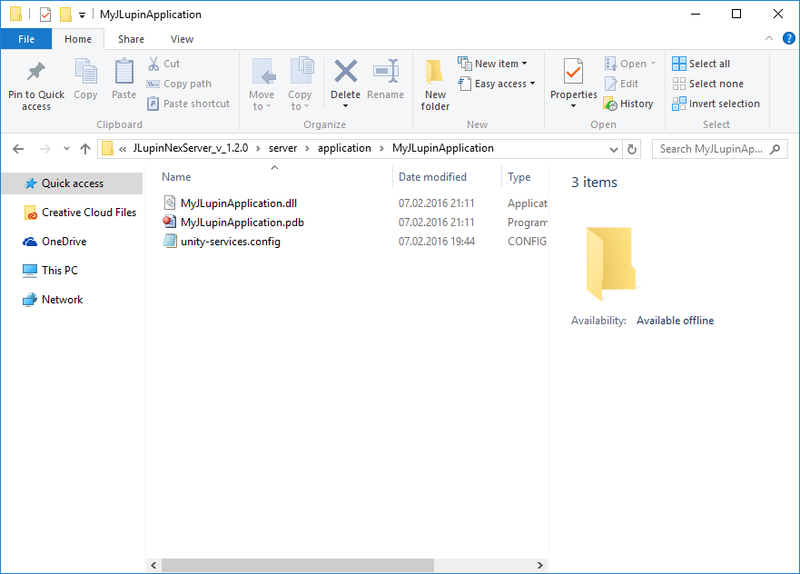 Make sure that the name provided in last method “MyJLupinApplication” is the same as your .NET application folder on JLNS created in step 2. .NET applications hosted on JLNS platform are automatically exposing all objects stored in .NET DLLs and registered in unity configuration file with name for all the other services on JLNS platform and external clients through variety of different protocols like: WS-XML, WS-JSON, Java Remote Object (binary). Use the SoapUI or other XML webservice client to send following request message to invoke your application. In “ApplicationName” you should specify the name of your JLNS application as configured in the JLupinGlobalMultiProcessConfigurationImpl.java configuration file and as your application folder is named. In “MethodName” you should specify the name of your .NET method that you want to invoke. In “SequenceName” you should specify the name of Javonet sequencer for JLupin and by default it should be set to: javonetParamArrayXmlInOutSequence. 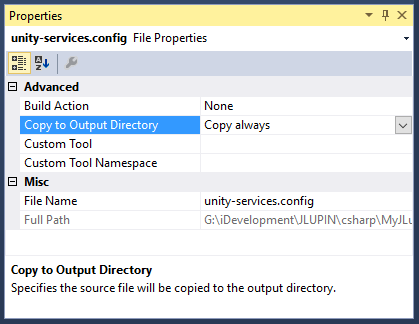 In “ServiceName” you should specify the name of your .NET service as defined in unity-services.config file. Use the SoapUI or other JSON webservice client to send following request message to invoke your application. In the param array input you should provide the json formatted array of input parameters. The name of the element should be the type of the argument and the value should contain the json serialized value of that argument. Below you will find download links to the sources of samples included in this document and full configured JLupin Next Server with sample .NET application deployed.